David Salter is Director of Presales at LiveTiles. His original background is in health care information systems (HCIS), application development and business analysis. He is now focusing on enabling simple, intelligent workplaces in the context of Office 365, SharePoint and Azure. One of the great frustrations of the modern workplace for those of us in sales is the number of different systems that we may need to traverse to access the people, processes and information we need to sell. Time spent simply locating what we need is time not spent doing what we should be doing – working with our clients to understand their needs and creating compelling proposals. The recent release of the new LiveTiles CRM (Sales) Tiles is, in my view, a game changer. These new ‘Salesforce’ and ‘Dynamics’ tiles allow my global network of sales colleagues and me to remain within a single dashboard. We can now focus on the world of sales without the need to keep track of scattered sources of business-critical information. With this ‘game changer’ for Salesforce and Dynamics 365, our CRM, together with Power BI and multiple other disconnected conversations, can be all on one screen, accessible through a beautiful single pane of glass. In a single click, I can now source information on competition, check the forecasting widget, assess how much a deal is worth, when it might be closing and how likely it is to close and much more. Now, that makes my work-life better and gives me serious efficiency gains because I no longer need to navigate between disparate systems to get what I need. It brings authenticity to the “single pane of glass” story with Salesforce and Dynamics CRM apps that collectively own approximately 52% of the CRM market. It touches real business processes like sales, moving beyond ‘intranet-only’ conversations. It seamlessly handles SSO after an initial login (single sign-on authentication). It offers up a real quality UX and supports complete Create, Read, Update, Delete operations on (for example) opportunities. The connector requires appropriate licensing in the source applications of Salesforce and Dynamics, removing any risk that you will be in breach of any licensing agreements. The updates between the SharePoint UI and Salesforce CRM are instant. Scalability was front and center in the minds of our dev team who considered the complexities of handling updates centrally from Azure – this is brilliant and serves as proof of what’s possible. CRM software can be clunky and complex but with this single pane of glass anyone can access the data, filter and extract it, analyze and leverage it. Imagine a C-level executive logging into their intranet portal then clicking down to a page dedicated to their client and being able to get an aggregated view of upcoming opportunities with that client – all without needing to go to Salesforce or Dynamics which is not designed for senior management. 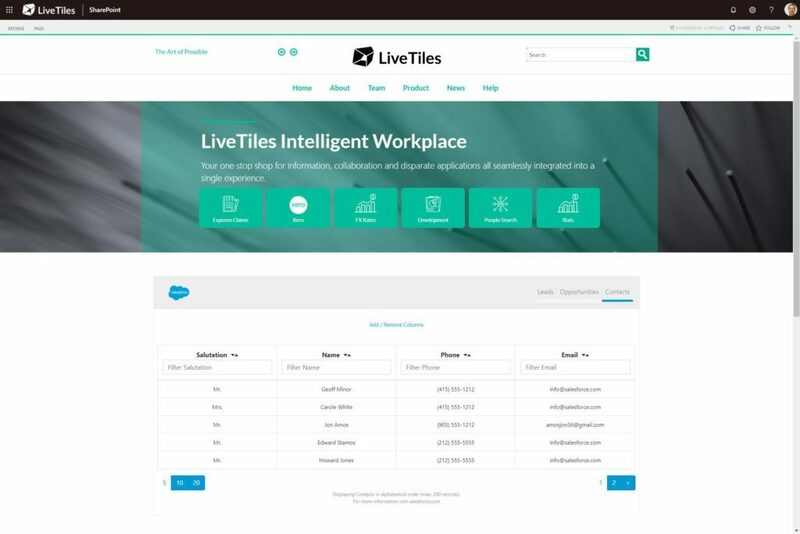 The new custom CRM tiles are right now being rolled out internally at LiveTiles and I know our customers will be every bit as excited about its performance as we are. If you would like to learn more or request a demo, please reach out to me directly at David.Salter@LiveTiles.nyc and I’d be delighted to support you. Watch this short video here to see the Salesforce CRM Tile in action; and for Dynamics users, we have that covered too.